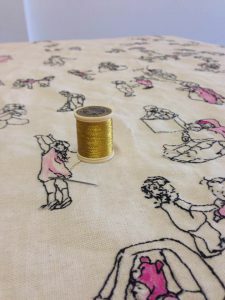 When you think of embroidery, you might picture quaint tea towels, stitched with inspirational quotes, surrounded by bouquets of flowers, or a cherished baby blanket, lovingly sewn by a doting grandmother. However, “Poetic Embroidery,” the current show at Central’s Melton Gallery hopes to challenge that notion, showcasing what embroidery means in an entirely different light. “Poetic Embroidery” displays two large-scale installations, each representing an unconventional approach to textiles. The use of unique materials within each work emphasizes the careful, meditative process of the creation. 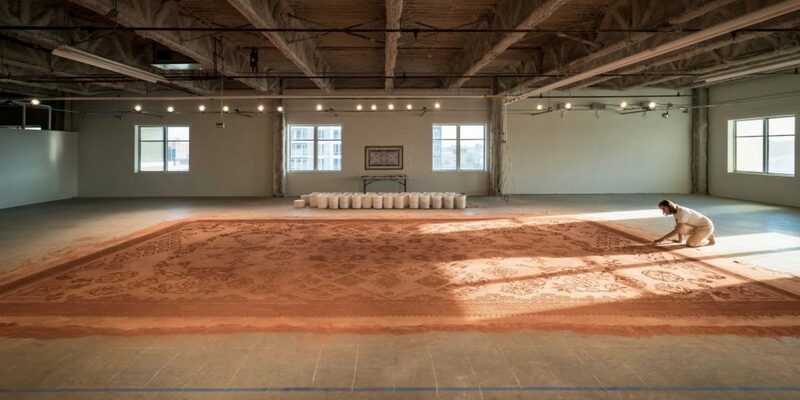 “Red Dirt Rug” features Oklahoma red dirt, shaped like a rug. 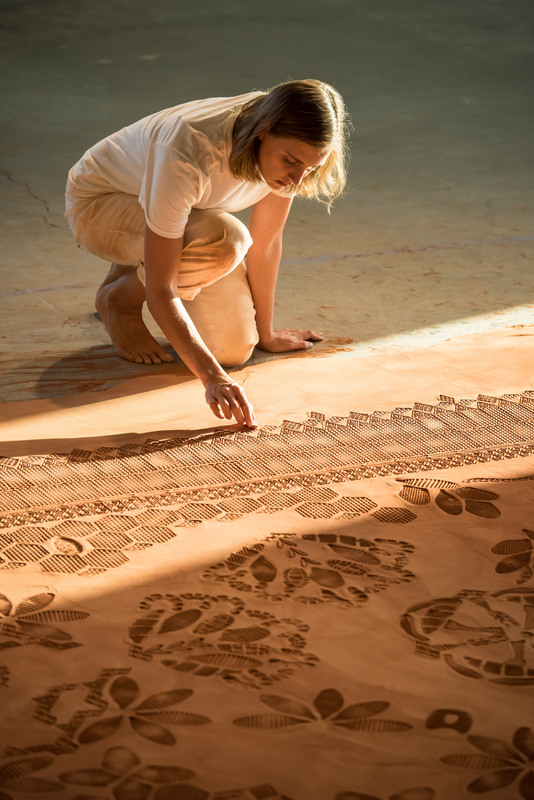 The first featured work, “Red Dirt Rug,” by artist Rena Detrixhe, is a decorative rug unlike any other. Formed from refined red soil, gathered in Oklahoma, the rug is constructed by carefully layering and smoothing the earth. 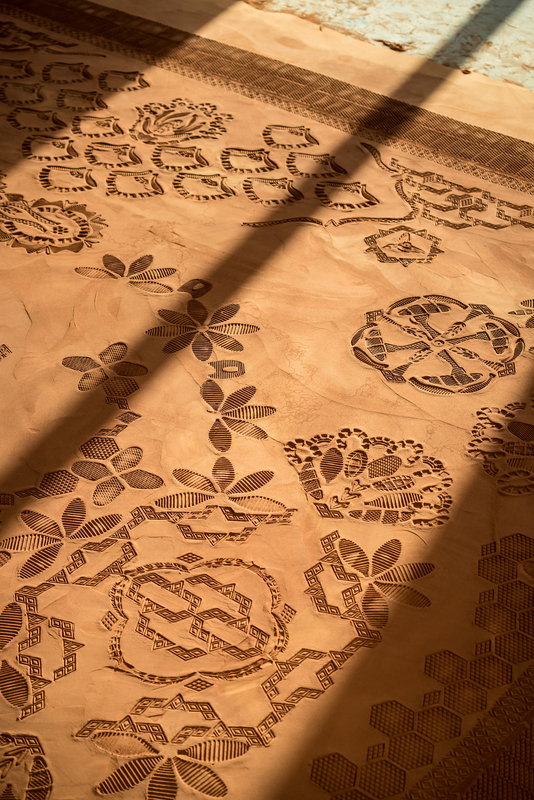 Detrixhe embellishes the rug with stamps created from the soles of shoes. “Tales of Woah” features figures of small girls, highlighted in pink. 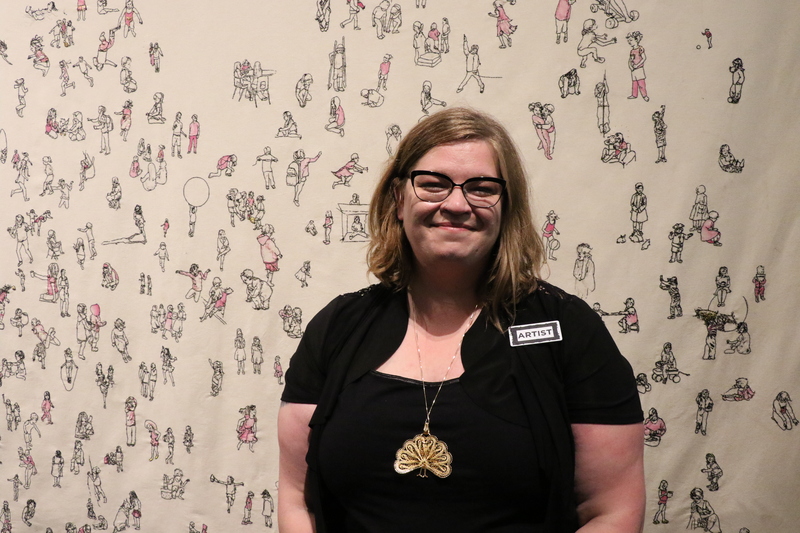 The exhibit brings Detrixhe’s work together in conversation with Kelly Rogers’ piece “Tales of Woah,” a hanging tapestry covered with embroidered renderings of Oklahoma girls. One-third of these figures bear a pink mark of ink, in homage to the one-in-three girls in Oklahoma County who suffer sexual abuse by the age of 18. Want to hear directly from artists Detrixhe and Rogers? Join them at an Artists’ Talk at 5:30 p.m. Sept 20 at the Melton Gallery. The talk will be followed by a Q&A with the audience. Detrixhe completing a red dirt piece. 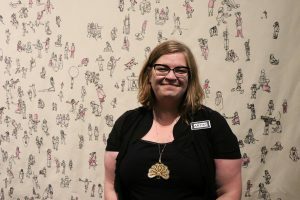 Detrixhe is a Tulsa Artist Fellow whose solo exhibitions continue to be featured in museums across the nation, from the Philbrook Museum of Art and Oklahoma Contemporary Arts Center, to the Abigail Ogilvy Gallery in Boston, Massachusetts and the Center for Craft, Creativity and Design in Asheville, North Carolina. Rogers posing with her work. 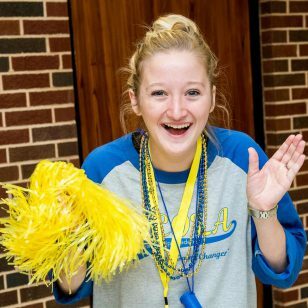 Rogers is a UCO alumna and one of five Oklahoma artists chosen by the Oklahoma Visual Arts Coalition to be featured in the 2017 Art 365 exhibition. “Poetic Embroidery” will be displayed in the Melton Gallery through Sept. 27. The Melton Gallery is free and open to the public 10 a.m. to 4 p.m. Mondays-Thursdays and on Fridays by appointment. For more information about the Melton Gallery, visit www.meltongallery.com.